Some years ago Bachmann offered a complete DCC 'starter' train set, which contained two locos, christened 'Stewart' and 'Greg'. These were 'generic' face-less versions of the Bachmann US HO scale 'Thomas' and 'Percy'. Despite their re-working, two models were judged to infringe the 'Thomas' UK licence held by Hornby, and they were therefore discontinued. With a train-orientated grandson, these looked like they would be a quick DCC project to provide a couple of fun locos for the 'big' layout. A pair were acquired when they came up on eBay. Placed on the layout using the NCE Powercab, the locos hardly moved. There was a distinct buzzing, as the motor received power on the first power step, but movement was sluggish, and then track power was lost and the cycle started again. It was if they had a really high acceleration setting, say a '10', such that the very slight acceleration detected was 'lost' when the short wheelbase failed to keep a connection with the track. And despite a visit to the programming track, and vigorous wheel cleaning, it appeared that they were 'duds'. The final development was to fit 'Stuart' with alternative pick-ups, with Paxolin sleeper strips glued to the bottom of the keeper plate. The photo below illustrates the current state of affairs, but with the wire wipers now removed, as it was found when running on DC, these no difference, and the original pick-ups were fine and did not need enhancement. A try out on the DC carpet layout found that both locos worked pretty well in this mode, although perhaps not quite as well as their Hornby equivalents, which were faster and more powerful.. Subsequently, the DCC decoder and associated boards were removed from 'Stuart', and again there was an improvement when running on DC. The photo below shows 'Stuart' sans decoder. Points to note are that the motor is fitted within the body, rather than to the chassis, so the chassis and body are an integral unit, precluding the use of the chassis separately. Note the central screw hole at the front of the chassis, below the smokebox. This means that the loco has to be fully stripped down each time the body is removed. The loco will work without it, but it is required to achieve correct meshing of the gearing. The fifth 'yellow' wire can be seen in the bunker, and is terminated on the rear of the motor casing. The motor lives in its own plastic housing, but only occupies half the available space. The motor seems small given the size of the loco, and the empty space within the housing is not available for extra weight. Although the cab roof detaches, the cab openings are filled in as part of the body, and so would have to be cut out, unlike on 'Greg' where the openings are filled by extensions from the underside of the roof. From the above running experience, it is apparent that the original chip is suspect, although it does seem odd that a major manufacturer would ship such a poor product, particularly as part of a starter-set, where easy set-up and operation is a pre-requisite. There do not appear to be any write-ups on the Web of experiences with these locos, and therefore it is unknown whether this experience is a 'one-off' or typical of the breed. The decision was made to re-chip 'Greg'. Removing the cab revealed five wires! Confusingly, the decoder has two pairs of red and blacks wires, plus two bright yellow wires wired from the motor-side tabs on the decoder to a nest of capacitors. The second pair of black and red wires terminate on a circuit board fixed into the cab roof. From there three wires run into the plastic outer motor casing (or inner saddle tank). These are the conventional orange and grey, plus a pale yellow wire. 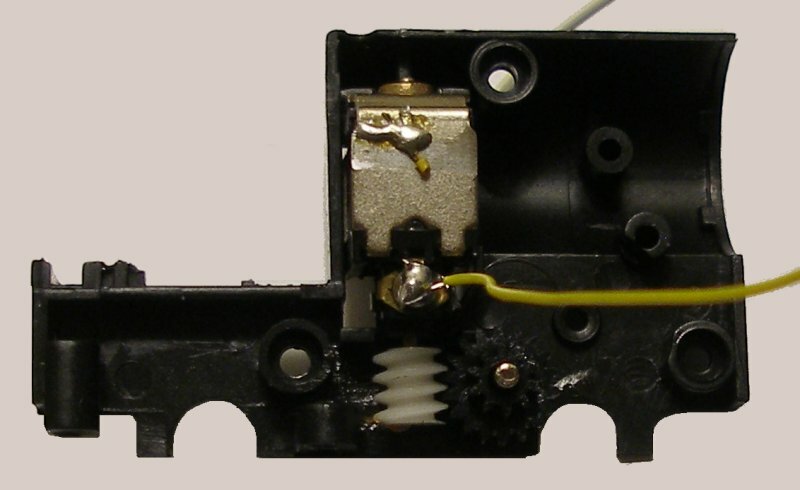 The purpose of the yellow wire, which appear to terminate on the motor casing, is unknown, as it is not a feature of any other model, either from Bachmann or any other manufacturer. I shared this on a Facebook group, and best suggestion, given the appearance of the circuit board, was that it might be a throw-back to the days of TV interference suppression. 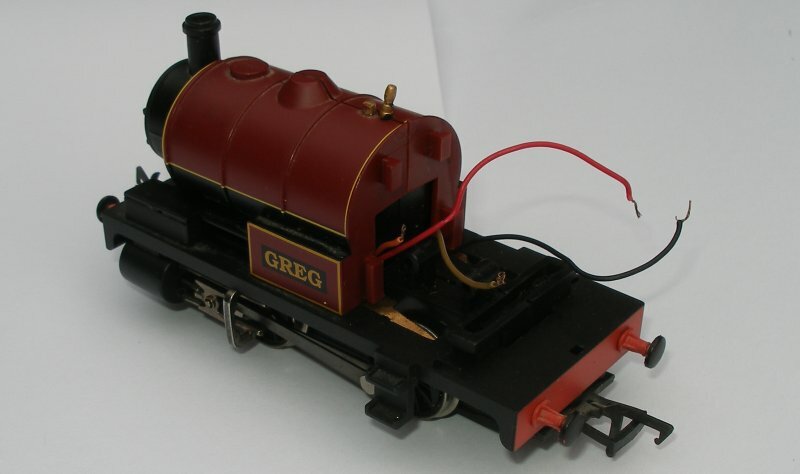 The motor has a plastic housing which is shaped to fit within the saddle tank, which means that there is no practical way to insert more weight, so limiting 'Greg' to 5 or 6 trucks. The only place it might go is next to the motor within the housing. 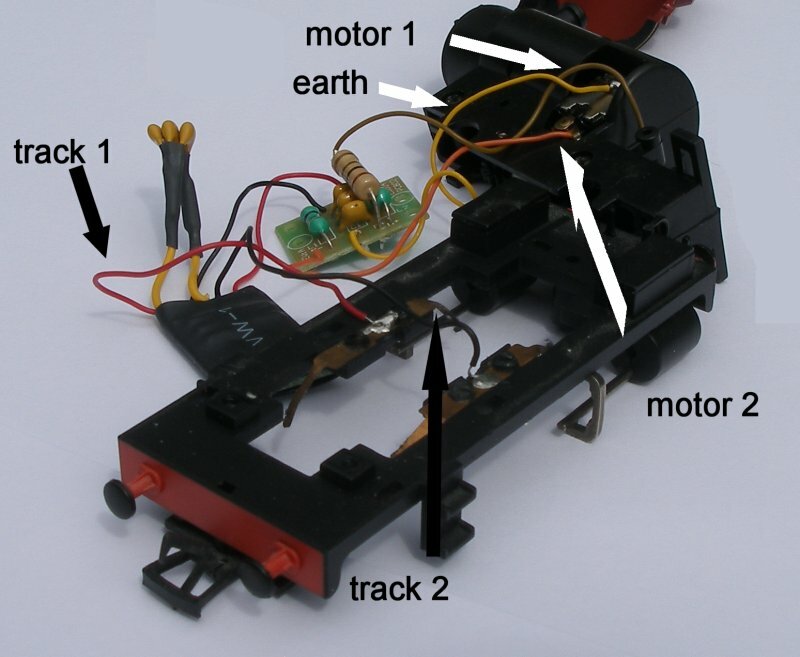 The photograph below shows how small the motor actually is, and also that it is mounted vertically. The cab openings are filled by a black plastic sheet which is an integral part of the cab roof. The circuit board is screwed into the underside of the cab roof, but with it removed (discarded), and the motor fed directly from the decoder, it is possible to cut these side sheets off, and therefore have open cab sides. Dismantling the loco is usually the easy bit - the putting it back together is always more challenging. The first attempt to re-assemble found that the wheels locking, but a second effort proved successful. Bachmann US offers a very comprehensive parts service, and these can be ordered directly. 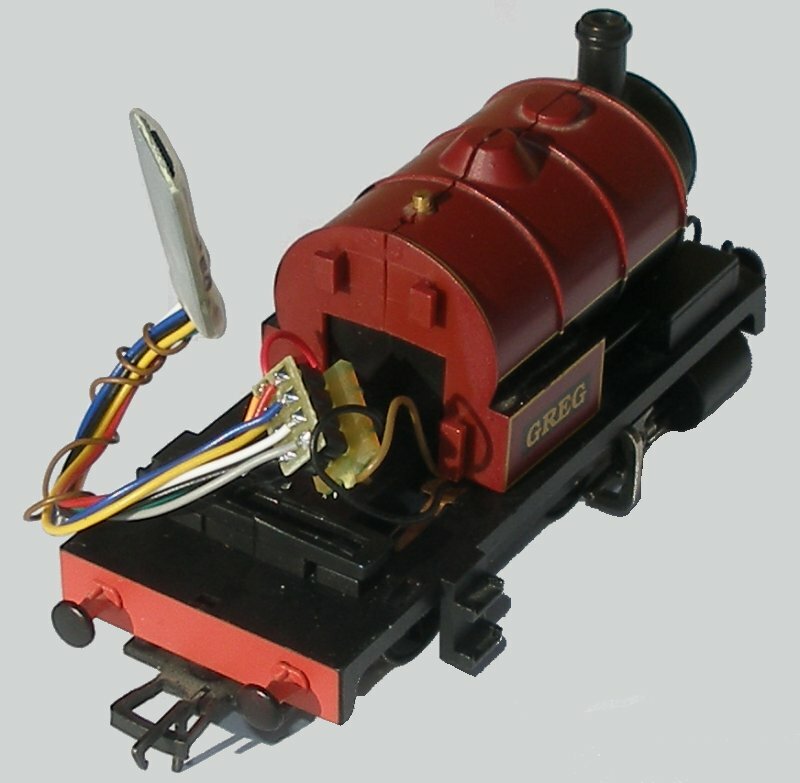 The complete motor housing, complete with 'Percy's eyes, costs US$ 25. Parts for 'Percy/Gerg' are here, whilst those for 'Thomas/Stewart' are here. The photos below show the loco now ready for the addition of the Gaugemaster DCC 61 socket, which will sit on the cab floor. Note how the saddle tank is held together, with two brackets on the rear of the tank that clip into a socket on the front of the cab and so 'lock' the two tank halves together. There are a couple of lugs aligning the top edges of the tank, but the one in the dome had been glued, and this had to be broken to take the loco apart. There were two silver screws and washers that held the footplate to the loco chassis (frames) but the screw holes were poorly formed, and these do not screw back in very well, so have been omitted for now, in the hope that the cab will provide the appropriate restraint. And now with the Gaugemaster DCC61 Medium Socket fitted, and a Zimo MX600R plugged in. DCC running was improved, but there was still a tendency to stutter, even with the wheels and track cleaned. It was then compared to the Dapol L&YR Pug 0-4-0ST (which is also fitted with a Zimo MX600R) and performance was markedly better on a number of criteria. The Pug clearly had more power, torque and better mechanicals (and the Pug is nothing to write home about!). But with the decoder removed and the blanking plate fitted, the loco ran well on DC - certainly better than it did with the original decoder and circuit board. Why the marked difference in running between DC and DCC with all the circuit boards and capacitors stripped out, and a quality decoder fitted remains a mystery. However, the opening out of the cab is worthwhile as this shot shows. And yes, it does look as if the tall whistle has gone missing since yesterday! The final question was whether the original Bachmann decoders re-cycled from 'Stewart' and 'Greg' could be used in other locos. 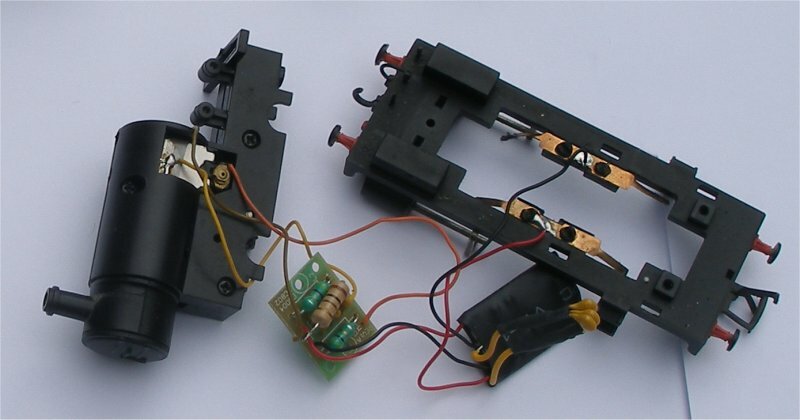 One of the decoders was attached to a harness, as the photo below shows. It may look crude, but it allowed the decoder to be tested on a number of locos. Plugged into a Hornby Royal Scot chassis, performance was minimal with the loco hardly moving. It was then plugged into a Heljan Class 33. Performance was improved, in that the loco was able to move forward and backwards, and ran relatively smoothly (the flywheels and weight of the chassis help in this respect). However, with the Zimo MX600R plugged in, there was dramatic improvement, with the loco's top speed almost doubling, and the loco running more powerfully and smoothly. It was clear that the functionality of the decoder is limited, and it might have a use as some sort of accessory decoder. How do these models compare to the Hornby offerings? The original Bachmann 'Thomas' models were developed for the US market and so the locos are based directly on the book characters. The Hornby models, however, used existing mechanisms with new or modified bodies. 'Thomas' is a rework of the Southern Railway (LBSC) E2 tank, and 'Percy' using the 'Smokey Joe' chassis with its Scalextric motor. Both the Bachmann models are therefore more authentic, in that 'Stuart/Thomas' clearly has the 'short stumpy boiler' of the books, and a neat, short wheelbase. 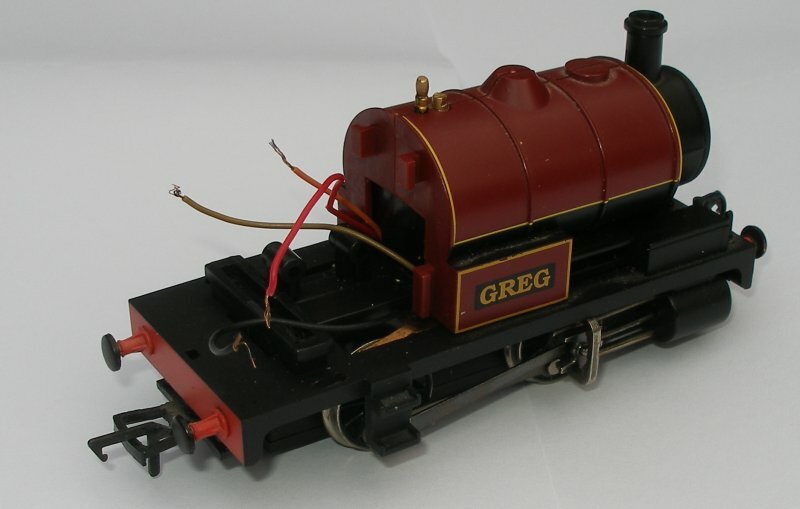 'Greg/Percy' is also shorter than the Hornby version. In contrast, both the Hornby 'Thomas' and 'Percy' are too long to accurately reflect the book characters. 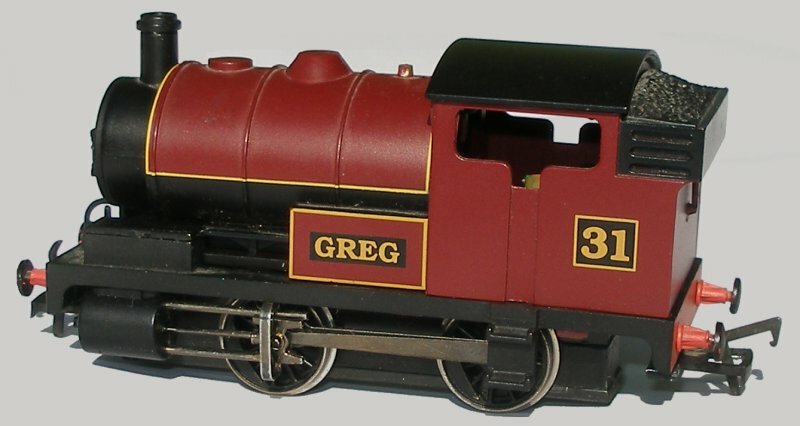 The Bachmann 'Greg'/'Percy' also has a neat set of cylinders with proper cross-heads and piston rods, whereas the Hornby offering has a combined connecting/piston rod that crudely sits inside a simplified cylinder. Running in DC mode, both the Hornby locos have a clear edge on the Bachmann pair (remembering the target audience for these locos). They run faster, pull better and are more robust, which reflects the larger motors fitted. The Bachmann locos run much better in DC mode than they do DCC - in fact, they hardly ran at all in DCC with their factory-fitted decoders. Ironically, removing the original decoder and circuit border has led to an improved performance in DC. They are still not as fast/powerful as the Hornby locos, but they can run confidently on a 'carpet layout' (perhaps we'd call them 'Pop-up Layouts' these days). The unexpected issue with the Bachmann 'Stuart/Thomas' is its wheelbase, which is surprisingly inflexible, and it does not cope at all well with 1st radius curves, frequently derailing. This was a real disappointment, particularly for the target audience (my 4-year old grandson) which started to get quite cross with 'Stuart'. The solution was to buy a set of 4th radius curves, and now 'Stuart' runs without derailment. Hornby has dealt with this problem by fitting flangeless centre driving wheels, which also have traction tyres fitted. So despite the longer wheelbase, the Hornby 'Thomas' can cope with 1st radius curves. 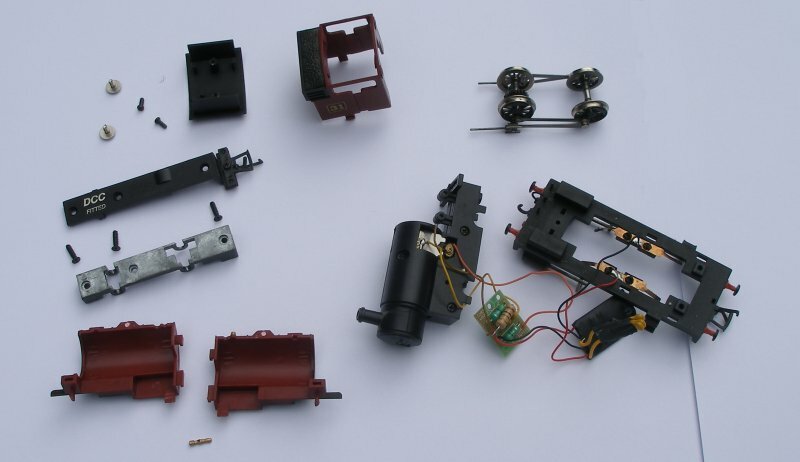 Applying the Bachmann decoders to other locos types (known to perform well in DCC with other decoders fitted) has established that these are inferior to current types. It could well be that they are an early design, and so are struggling with modern systems. Are the models capable of development? Bachmann US developed a layered approach to chassis design, so there is a traditional keeper plate which screws to a cast main chassis, which in turn fits within the plastic motor housing/smokebox assembly which in turn is screwed into the body shell. Any model fashioned from these 'base units' would have to encase the existing structure. Strangely enough, a very passable Tram Loco aka 'Toby' could probably be built round 'Greg', as it would then feature cylinders and motion under its skirts, and a smokebox visible through the front cab windows. However, the integral nature of the body/chassis means re-bodying the locos is virtually impossible. Are they effective ready-to-run DCC models? 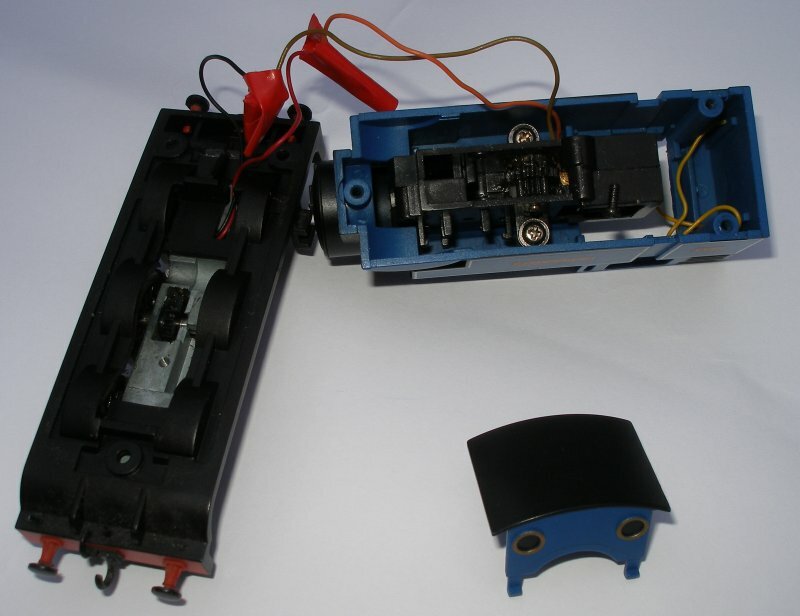 I have no experience of running the Bachmann pair with the original Bachmann control system as supplied in the starter set, and it is likely that Bachmann configured the models to work with their basic DCC throttle. However, on a DCC layout using a contemporary NCE Powercab they hardly 'run' at all. With the original decoders, there was hardly any movement. However, with modern decoders fitted, performance was 'passable', but perhaps not quite to a standard that could be called 'satisfactory'. 'Stuart' runs better than 'Greg' due to the extra pair of driving wheels, whereas 'Greg' needs to have its wheels cleaned very regularly, and would probably benefit from a 'stay alive' capacitor fitting. 'Greg' has smaller wheels than 'Stuart', and consequently the gear wheel casing on the keeper plate hits the facing point lock covers. This can probably be fixed with judicious filing. In conclusion, this venture has not provided the hoped for 'shortcut' to obtaining a couple of low-cost extra locos for the DCC layout, and the Bachmann locos are better suited to a DC table top train set operation. If buying new for use by children, I would recommend the Hornby offerings. Finally, Cliff has provided an excellent YouTube review comparing 'Stuart' with 'Thomas'.